Martin Strel, a legendary Guinness record marathon swimmer, has always been looking for the challenges of impossible and the Amazon was the recent one. On April 7th, 2007 Martin Strel completed his epic Amazon river swim all the way from Atalaya (Peru) to the Atlantic Ocean at Belém (Brazil). He was struggling the river for 66 days for more than 10 hours a day and totally swam 5268 kms or 3274 miles. He became a wordwide hero. Martin was born in Slovenia. Slovenia is a small Central European country located south of Austria. He taught himself to swim when he was 6, in a nearby stream, and became a professional marathon swimmer in 1978. Earlier in his life, he was a successful guitar player. He still plays a guitar nowadays a little. Martin has been swimming ultra-marathons and raising an important awareness of clean waters for many years. 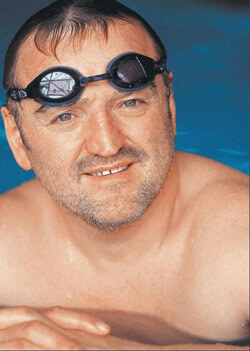 He has dedicated several swims to the protection of environmental resources. Many people still cannot believe what he has done so far, so that’s why they sometimes describe him as “Daredevil”, “Fishman”, “Human Fish” or even “The Craziest Man in the World”. Martin Strel has recently received many invitations from all over the world and he become an international speaker and educator. He has no future swimming plans at the moment as he is busy travelling around the globe.